This beautiful shawl is a simple, easy to memorize 3-row repeat that just flies by until the edging. It finishes with a spectacular show of clusters and picots. 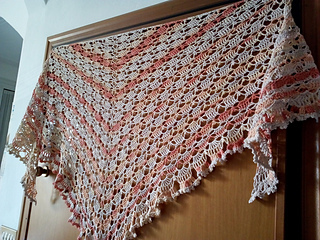 This lovely shawl is great to add warmth during the chill of winter while looking forward to spring’s renewal. Sizing--One size-- sample is 75 inches across the neckline, 34 inches deep. However, pattern can easily be made smaller or larger since the edging can be started on any 1st row of the 3-row repeat. Gauge is not essential to this piece.